Careers Cost > How Much Do Resume Writing Services Cost? In today’s economy and job market, one of the most important tools a person can have is a well-written resume. Hiring a professional resume writer can give you the advantage you need when applying and interviewing for a new position. Working with a professional resume service will get you the writing skills and objectivity to determine the right focus of your situation. This is a skill that is critical to landing a job in any field. 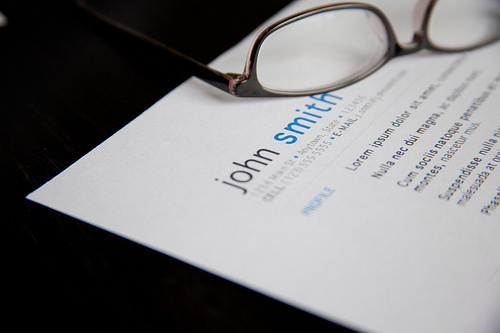 The price of a resume can vary depending on the type of job you are applying for. A resume written for an entry-level position will cost much less than a resume written for an executive position. Depending on the position, plan on spending anywhere from as little as $250 to more than $1,200. Refer to our chart below. What we did was call up a few resume services online and asked them what they would charge us. We didn’t list the company, but rather, listed what we told them. According to blueskyresumes.com, there is no blue book to tell you what you should be paying. She notes, in her personal opinion, that it should cost somewhere between $600 to $900. First, the service will gather your information either through email, over the phone or in person. With the information they receive, they will be able to write the resume based on what type of job you are seeking and what type of experience you have. Most of the time, if you choose a reputable service, they will match you up with a writer who has similar to experience to yours since they will know the industry’s “buzz” words and trends. Package deals will include extras such as a cover letter, a follow-up thank you letter and delivery. Interview coaching includes things like job-specific sample questions, salary negotiation strategies, and email follow-ups. Add-ons, such as writing a cover letter, can cost more due to the fact that this is separate from the resume. This can be an additional $50 to $100. Adding the resume to a CD can be an additional $10 to $20. Rush orders that need to be done in 24 hours can cost up to $100+ more if the service is available. Editing down the road once the resume has been accepted can be an additional expense. Keep in mind that many services will be more than happy to edit during the initial purchase. Do you have any type of certification? What is your educational background? May I see some samples you have written in the past? Do you offer a 100% guarantee? The cheapest way to use a resume writing service is to collect and compile all of your own information and then only have them edit and polish it. This is usually the cheapest service; however, it will take a lot more work on your part. Most services provide package deals which include more than one service. This is usually the cheapest per-service price. You may also want to consider picking up some Resume books and learning the art of creating a resume. Some websites, such as themuse.com, state you shouldn’t hire a professional because recruiters are able to spot professionally written resumes from a mile away. The reason? They tend to be boring and filled with fluff that the average applicant usually won’t include in their resume. If choosing a service, consider a package that puts everything together such as a resume, cover letter and thank you letter. This is a great way to save money on a bulk order, rather than purchasing them individually. When searching for a resume writing company, use services such as best10resumewriters.com to compile a list of suggested companies. Services that make a list such as this, however, will quite often be more expensive than a less popular company. Most resume writing websites offer samples of their work for you to read. When looking at these samples, pay close attention to the quality. Another thing to look at is the market strategy the company uses. Pay close attention to their website and see what kind of tactics they use. Is the website up to date? Is it modern and well maintained? Remember that this company will be marketing you, so you will want to make sure they are up to date on trends.